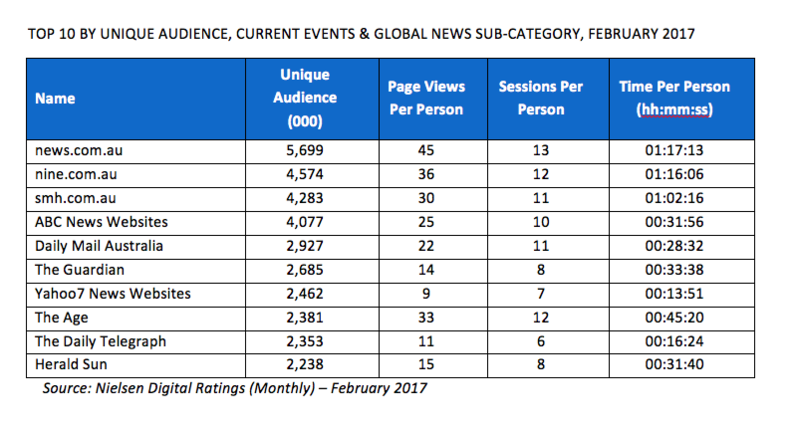 More Australians are actively online than ever, with Australia’s online unique audience hitting 20 million for the first time during the month of February 2017. Latest data released today by Nielsen reveals slight year on year growth across all key digital devices when comparing February 2017 with February 2016, with smartphones reporting the highest growth (+5%) – see table below. The Age jumped from 10th to 8th place with a unique audience of 2.4 million (+4%) and The Daily Telegraph saw a big uplift (+15 per cent) in unique audiences moving from 13th to 9th place with 2.4 million. The Herald Sun moved to 10th place with a unique audience of 2.2 million.